Have you ever tried to catch and counting fall leaves as they drop to the ground? Try this gross motor movement outdoor counting activity with the kids for a fun math learning activity in nature! One of my favorite things about the fall is the breezy days when the leaves rain down upon the Earth. It’s such a magical time of year filled with warm colors and the soft light or autumn. 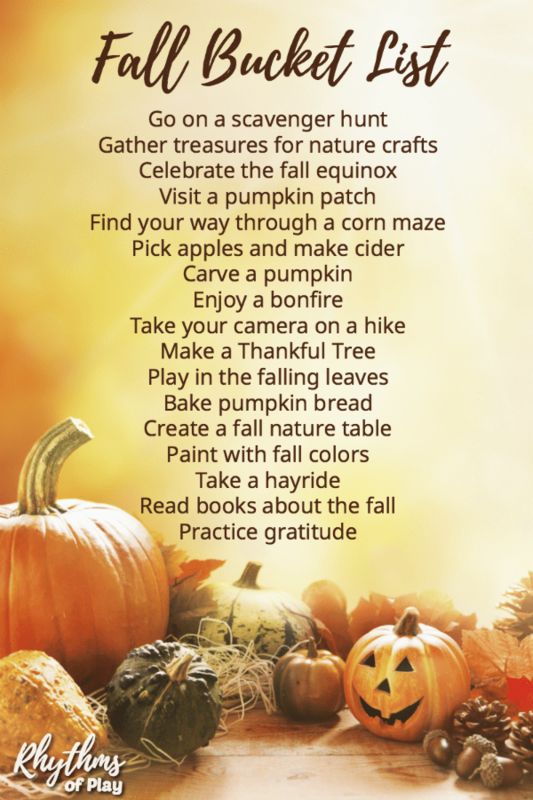 There are so many fun things to do with fall leaves. My daughter and I have made games out of catching and counting them that she loves to play! Get outside to catch and count falling leaves. It’s a very simple yet fun outdoor counting game that my daughter loves to play. There are many ways to play depending on the age of your child and their ability to count. You can even make up your own way to play. If your child isn’t ready to count or doesn’t want to count don’t force it. Catching fall leaves is an environment ripe with opportunities to learn on its own, counting game or not. Learning can happen naturally when children are allowed to play and engage with what interests them. Catching falling leaves is a fantastic activity for gross motor learning, hand-eye coordination, and sensory input of all kinds whether they are counting or not! Go ahead, invite the kids to try to catch the leaves and see what happens. 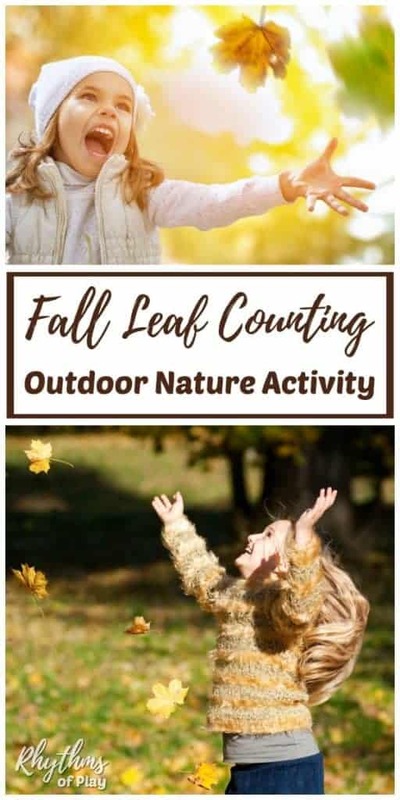 My daughter and I started this leaf counting outdoor game when I invited her to try to catch leaves in our backyard one day as they fell to the ground. Before I knew it a half an hour had passed in a hundred and one blissful squeals. When she was finished she asked me how many leaves she had caught. “How many leaves did I catch mommy?” She asked excitedly. I had absolutely NO idea… I stole a few moments while she was happily engaged in this nature play activity. It was lovely! She was not happy about this. Mommy should have known the answer, and I did not–whoops! The next time she played I was ready for the “how many leaves” question. Before she started, I asked her to run over to make a mark on our outdoor chalkboard each time she caught an autumn leaf before it fell to the ground. Making a mark after catching each leaf made the game even more exciting for my daughter. Running to the chalkboard to draw another line on the chalkboard became a reward for her because she did not catch very many. When she was done catching falling leaves she could look at how many marks she had made and count them to know how many leaves she had caught. How many autumn leaves can you catch before they fall to the ground? If you have more than one child they can choose to make it a competition, or they can make up their own way to play. Allow children to work out their own rules. This adds a social-emotional component to their fall leaf nature play game. On a day when the leaves are falling invite your children to try to catch and count the falling leaves! This fall leaves counting activity is fun for all ages. Learning can happen naturally when children are allowed to play, catch, and count falling leaves. Follow the lead of your child and you can’t go wrong. For more fun ways to play with fall leaves outside click on the link! You may also enjoy these conkers activity ideas from Red Ted Art, making a tree scrapbook by Preschool Naturally, and this collection of outside learning ideas and nature activities for kids. Don’t forget to check out our Fall Bucket List for The Best Autumn Ever! I’m so glad that you have the opportunity to enjoy autumn leaves raining to the ground in your own backyard. I hope your little one enjoyed catching and counting fall leaves! Playing with leaves is one of our favorite parts of fall, and I love all the learning potential! Thanks for sharing, Nell. Ours too! There are so many fun ways to play and learn with leaves.